Philosopher and educationist, among the initiators of positivism in Italy, to which he turned after an early Hegelian education. Removed from the senior secondary schools for the irreligiousness of his teaching, he taught pedagogy and anthropology in Bologna from 1871 and pedagogy in Naples from 1876. 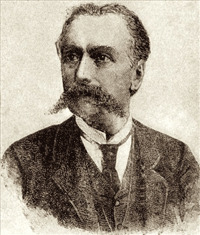 He edited several reviews; among them the Rassegna critica di opere filosofiche scientifiche e letterarie (1881-1889) must be mentioned as the chief organ of southern Italian positivism. 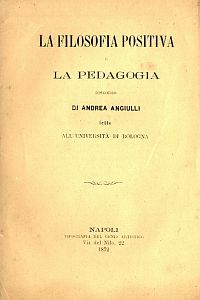 Angiulli’s library can be considered an example library of a late nineteenth century Italian positivist, with a non-scientific education, or rather a "professional" philosopher. Proceeding from a position related to Comtian positivism, he arrived at an evolutionist synthesis with characteristics of its own, in part eccentric if compared to those of the Spencerian school that prevailed at the time. Main works: La filosofia e la ricerca positiva (Napoli 1869); La pedagogia lo stato e la famiglia (Napoli 1876, 18822); La filosofia e la scuola. Appunti (Napoli 1888). Bibliography: E. Garin, Angiulli, Andrea, in Dizionario Biografico degli Italiani, vol. 3 (1961); A. Angiulli, Gli hegeliani e i positivisti in Italia e altri scritti inediti, a cura di A. Savorelli, Firenze 1992, pp. 63-71. When Angiulli died, his library remained to his heirs along with his papers and his manuscripts. Subsequently, as far as we know, it was scattered around Puglia in varoius institutions and libraries. A substantial part of it, maybe the richest, contributed to constitute the original endowment of the town library "G. Tauro" of Castellana Grotte, to which it was given. This collection is not held in a single location, but disributed in various sections of the library. There is no topographic catalogue of the bequest, only an inventory, which consists of - without inner distinctions or acronyms - the collections of Angiulli and that of Giacomo Tauro (1873-1951). This latter was another local educationist with an evolutionist education, professor at the Universities of Cagliari, Bologna and Rome. The only useful element to the identification of the volumes of Angiulli is the publication year, keeping in mind as terminus ante quem the year of his death (1890).